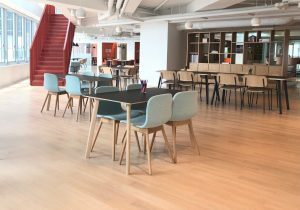 (21 August 2018, Hong Kong) – Creative workspace provider Spaces announced today the opening of its new location at 133 Wai Yip Street, Kwun Tong, providing enterprises with 37,500 square feet of innovative office space across three floors, including the rooftop floor. 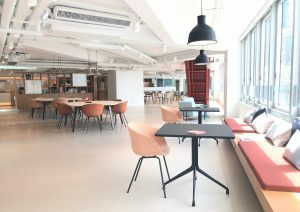 The opening of Spaces Wai Yip Street signifies a rapid expansion in Hong Kong and comes a month after the opening of its first location at Lee Garden 3.The Amsterdam-based workspace provider is set to open a total of five locations in Hong Kong before the end of 2018, offering 236,700 square feet of Dutch-inspired, flexible workspace to more than 2,500 freelancers and employees from a diverse range of enterprises. Now opened, Spaces Wai Yip Street is located at the top three floors of a newly renovated commercial building in Ngau Tau Kok, Kwun Tong. The Business Club, which occupies the 12th floor, provides vast open areas and extensive facilities including designer sofas, phone booths, communal tables, “think tanks”, meeting rooms, and meeting booths, for every business need. The 11th, 12th and rooftop floors offer close to 100 private offices which are available for rent in an array of shapes and sizes. Adjacent to Kwun Tong Promenade, Spaces Wai Yip Street provides spectacular panoramic views of Victoria Harbour and is conveniently located just 200 metres from Ngau Tau Kok MTR Station. Spaces Wai Yip Street is inspired by the brand’s European design concept, but includes local elements, which aptly preserve the features of old Kwun Tong’s industrial hub. The main areas are covered in cement and wooden flooring, and decorated with warm, soft-toned European furniture, giving Spaces Wai Yip Street a defined yet refreshing look. The 12th and rooftop floors are connected by an interior staircase, bringing convenience to tenants as well as forging a sense of spaciousness. The open stringer design draws in natural light and provides transparency throughout the office. The rooftop floor features a comfortable outdoor area and both the 11th and 12th floors are equipped with balconies, allowing tenants to enjoy fresh air from outside at any time. Meanwhile, studies have shown that working under natural light can increase productivity by 6% and creativity by 15%. In addition to large windows, an innovatively designed skylight drenches the office space in natural light, providing members with the optimal working environment. In September, Spaces will launch a new location in the southern side of Hong Kong island — Wong Chuk Hang. With the government’s redevelopment plans and the completion of the new railroad extension, the old Wong Chuk Hang industrial area is fast evolving into a hub for business collaboration, arts and innovation. 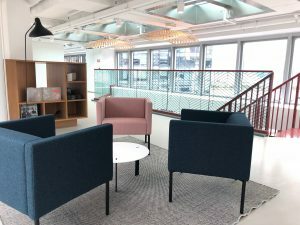 Spaces AXA Southside is located at a Class A office building in Wong Chuk Hang, providing 34,000 square feet of creative working space spanning across 4 floors. Just a two-minute walk to the Wong Chuk Hang MTR Station and a 15-minute drive from Hong Kong’s central business district, Spaces AXA Southside is extremely accessible. Spaces believes that the culture of community is an indispensable element of co-working spaces. While actively establishing new locations in the market, Spaces has also been facilitating exchange among different industry sectors, as well as organizing and supporting a multitude of events shortly after it set foot in the city. 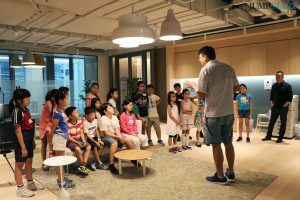 One such event is the Jumpstart Kids 2018 Summer Camp – an educational program tailored for children interested in entrepreneurship. The program invited 14 startup professionals, including startup founders, entrepreneurs and university lecturers to touch on topics such as design thinking, crowdfunding, and cutting-edge technologies through fun activities. With a mission to nurture future entrepreneurs for the community, Spaces fully sponsored the tuition fees of 3 students so that they could participate in the program without any financial pressure. Spaces is a brand under the IWG, the world’s leading workspace provider. All Spaces members can enjoy full access to IWG’s global network of more than 3,000 flexible workspaces.